The Chabad House is not just another building... it is a home away from home for everyone who walks through its door. The building is designed with space for huge holiday and Shabbat celebrations, lectures and special events and spaces for smaller groups to connect. Spaces for study and research; spaces to meet and plan; spaces to relax and play; spaces to pray; spaces to enjoy delicious kosher food; spaces for lounging and comfortable conversation; spaces to find comfort and counsel in times of need. A place you never want to leave. 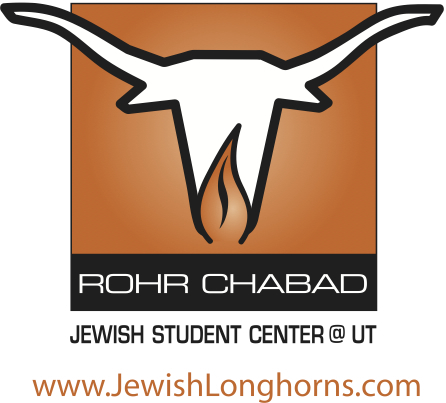 Rabbi Zev and Ariela Johnson, along with their children, co-direct the Chabad Jewish Student Center at UT. Rabbi Zev is an alumnus of UT. He continued his education at the Rabbinical College of America and received Rabbinical ordination at the Mayanot Institute of Jewish Studies. Ariela is a graduate of the Yeshiva of Greater Washington. She continued her advanced Jewish studies in Australia and Israel. Rabbi Zev and Ariela are living their dreams co-directing Chabad House, where they strive to fulfill UT's motto, "What starts here, changes the world."